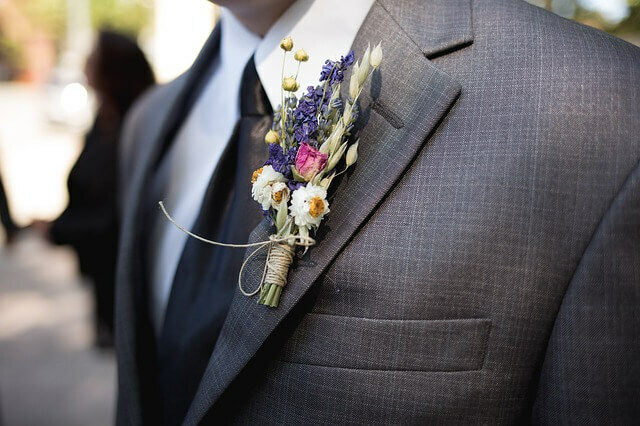 Does your groom recoil at the thought of wearing a traditional boutonniere? Maybe he’s looking for a way to personalize his ensemble, or perhaps the two of you are searching for fresh ways to customize your wedding. Explore these non-traditional boutonniere options and discover which one may work for the groom and his buddies on the big day. For the groom who loves all things steampunk and sci-fi, there’s the steampunk boutonniere. Ask an artistic friend to assemble one using tiny gears, chains, and clockwork. Your wedding guests will love the originality and artistry of the piece! Does the groom have a snazzy vintage brooch that was once owned by a grandmother or great-grandmother? Why not use it as a boutonniere? Even if there’s no family heirloom available, you can find stunning brooches at local antique stores or even at thrift shops. Is your wedding taking place on a specific holiday? Why not have tiny bats or miniature Jack-o-lanterns for Halloween wedding boutonnieres? For a Day of the Dead wedding, incorporate miniature Day of the Dead masks; for a Christmas wedding, include frosted snowflakes or pinecones encrusted with artificial snow. How about a gorgeous plume, a quill pen (no ink), or a set of feathers instead of a boutonniere? The feathers might be a keepsake that relates to your dating history, or simply an attractive alternative to the traditional pinned flowers. Of course, double check to be sure that the feathers are not from any endangered species of bird. Why not have the groom and his guys each select a favorite Lego minifigure to be part of their boutonniere? Or select minifigs that go along with the theme of your wedding— wizards and knights for a fairytale garden wedding, ninjas for an Asian-inspired celebration, or cowboys for a rustic country-themed wedding. Add a sprig of greenery, and you’ve got fun, original boutonnieres! Instead of using real flowers, create artificial paper flowers for the boutonniere from a thrift store copy of each groomsman’s favorite book. If you like, you can DIY the pieces yourself using tutorials you find online. However, if your skills might not be up to the challenge, perhaps you have friends who excel at origami or paper sculpture. Tiny paper dragons, swans, lizards, or other forms serve as incredible boutonnieres that your groom and his guys can keep and display as art if they like. What does your groom enjoy doing? Instead of sticking him with a standard boutonniere, celebrate his hobbies with a special lapel piece. Does he enjoy gambling or games? Include a pair of dominoes or dice in the boutonniere. Tiny wooden skis and ski poles, tied with a ribbon, form the perfect boutonniere for a skiing enthusiast. Are you marrying a skater? A miniature skateboard works well as a lapel accessory; or try a small stick of RAM or a little circuit board for a techie groom. Leaves, pinwheels, felt creations, acorns, fruit, gemstones, or tiny superhero figures— almost anything can be made into non-traditional boutonnieres for the groom and his guys. Use your imagination and allow the boutonnieres to be an expression of personality and joy. If you’d like to know more about the types of boutonnieres we’ve seen at Nanina’s in the Park, talk to our event specialists. Not only can they give you the grand tour of the estate and gardens, they can also share ideas and inspiration to help you plan your perfect, personalized wedding.